Every bit of music Jack White lays his hands on seems to sound so rigid. For someone who aims to be the savior of rock and blues, two styles with the loosiest-goosiest of spirits, he attacks each song as if fearful he’s going to knock even one hair out of place. This is even more evident listening to White play drums in his side project, The Dead Weather. The sound is stiff and mannered, almost fearful. It doesn’t come as naturally to him as his guitar playing or his singing. He’s just like Lenny Kravitz and Josh Homme when they get behind a kit; they’re obviously having fun, but there’s no swing in their playing. It’s important to note this at the start because the backbeat is so very important to setting the tone of any rock band. White certainly knows his way around a kit and does a fine enough job leading this quartet through its third album. 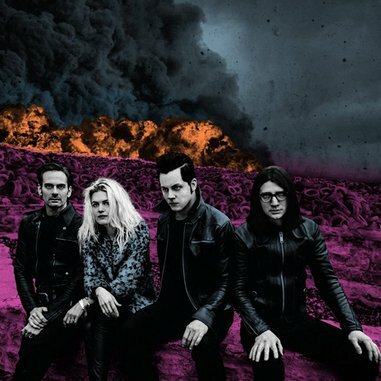 But just like the other two full-lengths by The Dead Weather, he also forces the rest of his bandmates to play their parts with a clipped inflexibility that makes these songs feel more algorithmic than rhythmic. As ever, the element that keeps the band from coming off as completely robotic-sounding is frontwoman Alison Mosshart. She is a marvel on this new album, wrapping her powerful whiskey-tinged pipes around these tunes with a vise-like grip. She sends White’s agitated vox packing on the bluesy call-and-response of “Rough Detective,” wails like a hard-rock goddess through “Lose The Right” and “Be Still,” and gets her soulful Shirley Bassey on as part of the string section-aided album closer “Impossible Winner.” She just might be the perfect foil for the Third Man Records impresario’s goal of saving rock music from itself. To achieve that, White is going to need to loosen his grip on the drumsticks a bit and put a little more wiggle in those slim hips of his. With every release he’s been a part of recently, you can hear him ease up on the throttle a bit. Here it’s on tracks like the Yeah Yeah Yeahs-like funk of “Too Bad” and the ridiculous throwaway track “Three Dollar Hat.” Both tunes exhibit a sense of humor that the rest of the album is too often lacking. White is not hurting for fans in any of his musical guises, but he might have many more if he were to lighten things up a bit.